Radio Sputnik discussed his legacy with Edward Berkowitz, Ph. D., Professor of History and Public Policy and Public Administration and Director of the Program in History and Public Policy, George Washington University in Washington, D.C.
Sputnik: What were the major highlights of Mr. Bush's presidency? How relevant are his achievements today? Prof Edward Berkowitz: The highlight of George Bush's presidency was that he happened to be the President of the United States at the end of the Cold War, which really changed the world politics and I think it had a profound effect on the United States relations with Russia. So that was his signal achievement. At the same time, he started what became a new round of international disputes with a war in Iraq and you know that war became kind of a signature activity of his presidency that he was not going to tolerate radical Islam getting too far in the world. And so I think those were his two main achievements, although he had others. 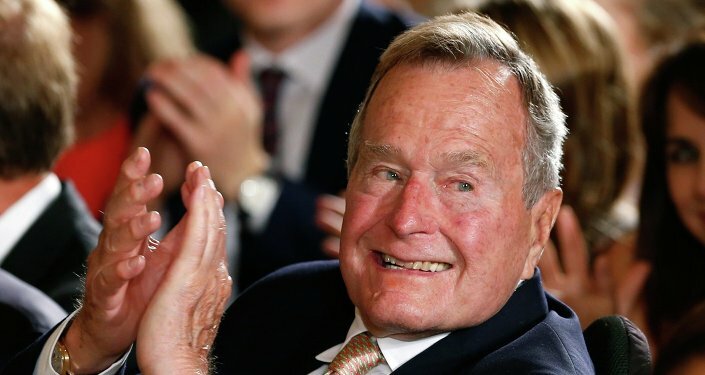 Sputnik: And what about the legacy of George H. W. Bush? How will be remembered as a man? Prof Edward Berkowitz: Well, I think he will be remembered as an aristocratic man in the American sense. He went to the best schools, came from a wealthy background but also a very kind and gentle man. The kind of man who wrote ‘thank you' notes to everyone. The kind of man who was very-very considerate to those around him and I think his legacy is kind of burnished by the fact that his son became president which is you know it happened once before in American history. And people often compare him favourably to his son as a sort of gentler and more able and wiser of the two and I think that will affect his legacy as well. Sputnik: Well, I tend to agree with you on those points. What are the centrepieces of George Bush's presidency was the Gulf War, viewed as the first test of the New World Order, which Bush proclaimed in 1991? What is your take on the New World Order and whether this test was passed? It only seemed yesterday this first Gulf War, I remember I was about 26…27 at that time but time is flowing by, he was the president during that time, what is your take on that particular stage of his presidency? Prof Edward Berkowitz: Well, he was very much the driving force behind starting that war. The war was very short, only lasted a few days, and much of it was televised to the people here in the United States. That is really in contrast to later wars in that region, which actually continue to the present day. So if the war in Iraq was supposed to kind of end conflict in the Middle East and establish the United States' position in the Middle East, it can't be judged much of a long-term success. You know, Iraq is still unstable despite the fact that George Bush won the Gulf War. So, you know, this is still happening, we have to wait to see what the ultimate results are but one can't judge that the Gulf War is ultimately a success. Sputnik: Now, Bush's presidency was marked by the end the end of the Cold War, you have already mentioned that. We are 27 years further on and we are still faced with many-many challenges between the relationship, the geopolitical situation between the US and Russia. How would you characterise relations now between the two superpowers? Prof Edward Berkowitz: Well, I am not an expert and I am sure that many people that would listen to are. But right now the relationship between the superpowers (among the superpowers) has definitely deteriorated. We should remember that George Bush before he became president was an ambassador to China. So he had connections to China and was able to kind of smooth things over and as far as we know he had a good working relationship with the Russian leadership. All of that has changed and President Trump has a different outlook about relationships with the Soviets and the Soviet Union as we used to call it, Russia. So you know, again there is a lot of ambiguity. Sputnik: Well, for sure. Well, let me ask you this one when we think of George Bush is someone who's primarily interests were in foreign affairs. He seemed to be a very proficient leader and the President when it came to diplomatic relationships. We have seen a distinct difference in the administration of the President administration of the United States. Did he have any significant other domestic achievements that people outside the USA are not aware of? Prof Edward Berkowitz: Yes, and I think that's an important point. Some people may be familiar with a kind of international movement for [what] we call it in this country ‘Disability Rights', the rights of people with handicaps to have employment and other privileges of citizenship. It's a major civil rights issue around the world. In our country, in the United States, George Bush was instrumental in signing, what we call the Americans [with] Disabilities Act in 1990, the major statute about disability rights. And he did that largely on his own. The Democrats were also sympathetic but he did that on his own and that is a major addition to American domestic policy, and it's not one that George Bush gets a lot of credit for. So I think it is important to mention that. Sputnik: Well, absolutely. And Edward, just finally, we have touched on it slightly, how is the present US regime different from George Bush's regime in terms of diplomacy and foreign affairs? It is certainly different from what I can remember of George Bush's time. What can you add and tell us? Prof Edward Berkowitz: Well, George Bush, you have to remember, had been head of CIA and had been ambassador to China, had lots of foreign policy experience. Prof Edward Berkowitz: Donald Trump doesn't have that and he speaks in a different language. George Bush had this very kind of a kind language for everyone and was very sympathetic to his fellow leaders around the world. Donald Trump doesn't believe in that, he believes that America should come first and that he should aggressively make that point when he deals with foreign policy situations. Another key thing that is different is George Bush was a major exponent of free trade as was his party and that was a traditional cause. And [he wanted] international agreements to govern trade around the world whereas Donald Trump has very emphatically made the point that these are not particularly good things and they should be examined very-very closely. So, Donald Trump, he is just a very different kind of person. George Bush was kind of an aristocratic leader, who sort of came by his high position naturally. Donald Trump, he has a much more sort of audacious attitude and a very different outlook on the world, I think.